Pont-de-Buis Brittany is beautiful and has lots of bed and breakfasts. 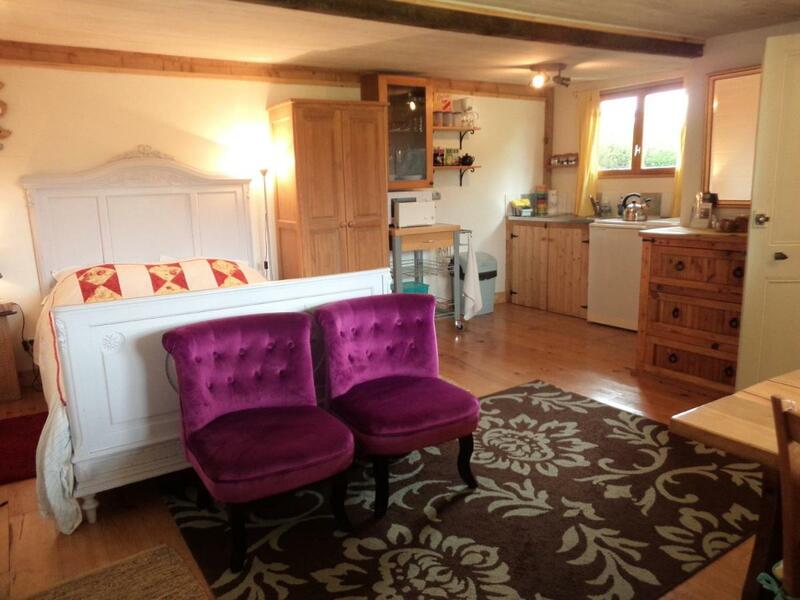 Ofcourse we are only looking for the best bed and breakfasts in Pont-de-Buis Brittany. 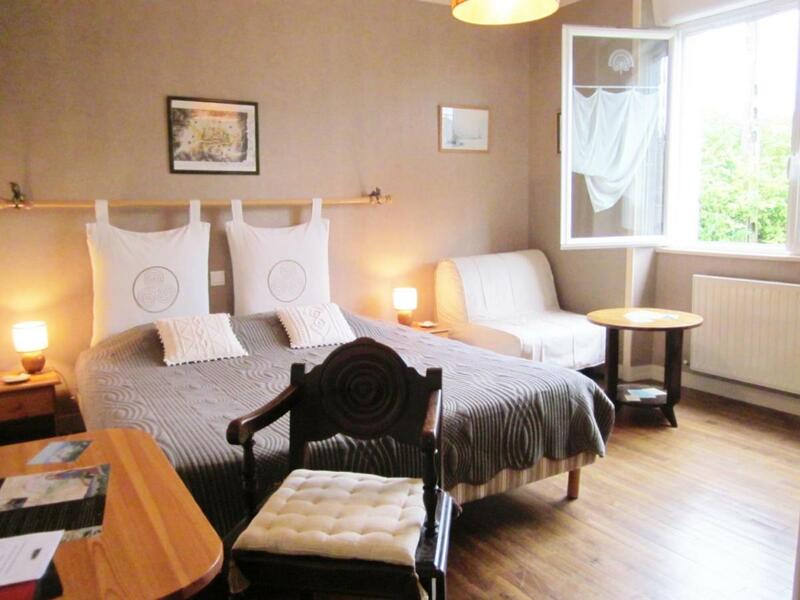 It’s important to compare them because there are so many places to stay in Pont-de-Buis Brittany. You’re probably wondering where to stay in Pont-de-Buis Brittany. To see which bed and breakfast sounds better than the other, we created a top 10 list. The list will make it a lot easier for you to make a great decision. We know you only want the best bed and breakfast and preferably something with a reasonable price. Our list contains 10 bed and breakfasts of which we think are the best bed and breakfasts in Pont-de-Buis Brittany right now. Still, some of you are more interested in the most popular bed and breakfasts in Pont-de-Buis Brittany with the best reviews, and that’s completely normal! You can check out the link below. Skip to the most popular bed and breakfasts in Pont-de-Buis Brittany. Featuring free WiFi, a barbecue and a sun terrace, The Studio offers accommodations in Saint-Ségal, just 21 miles from Brest. Free private parking is available on site.Each room comes with a flat-screen TV. Certain accommodations include a sitting area where you can relax. Enjoy a cup of coffee from your terrace or patio. Extras include free toiletries and a hairdryer.Quimper is 15 miles from The Studio, and Concarneau is 25 miles from the property. Guipavas Airport is 21 miles away. Best bed I’ve ever slept in. Val & Alan Bennett perfect hosts. The breakfast tray will keep you going til supper. Gorgeous rural location with charming towns nearby. Everything ! Particularly the location – right out in the beautiful countryside ,away from the hustle& bustle , so peaceful and calming . The studio itself was spacious , lovely to have tea making facilities and all you’d need to make a meal if you wanted to which we didn’t , although if we’d stayed longer we’d definitely have done that. The bed was so comfortable and warm and the bathroom was perfect too . To have breakfast served to the studio by Val our hostess, was an added bonus . All you’d want for breakfast too – cheeses , cold meats , lovely fresh baguettes and croissants as well as home made jams & fruit plus cereals too . A window looking out onto the spacious grounds with our own patio area & even a barbecue and huge outdoor table too and beyond that the fields & hillside in the distance . Also Val was charming and helpful in every way . La proprietaria è gentilissima e accogliente. il posto è immerso nella pace e nella natura. veramente ben tenuto con cura dei dettagli. colazione super, e servizio impeccabile. Les fruits, le thé,le cafè, les jus de fruits tout était à dispo, le petit déjeuner copieux nous était apporté directement dans le studio. Sur nous reviendrons. Villa d’Ys offers accommodations in Châteaulin. Free private parking is available on site.Certain rooms include views of the river or garden. Every room is fitted with a private bathroom fitted with a shower.Brest is 23 miles from Villa d’Ys, and Quimper is 14 miles away. Guipavas Airport is 23 miles from the property. Very friendly and helpful couple, couldn’t fault the room – spotlessly clean with a view over the garden and Chateaulin town. The bed was extremely comfortable. Only stayed one night, but would definitely stay again. Breakfast was croissants, toast and jam with a great selection of homemade preserves and 3 different types of local honey. bed was comfortable but with a rather heavy duvet and only one window to open for some air. Perhaps some different tea or coffee sachets would be useful especially to the British taste!! The breakfasts were fantastic – home made jams and lovely selection of local bread and pastries. 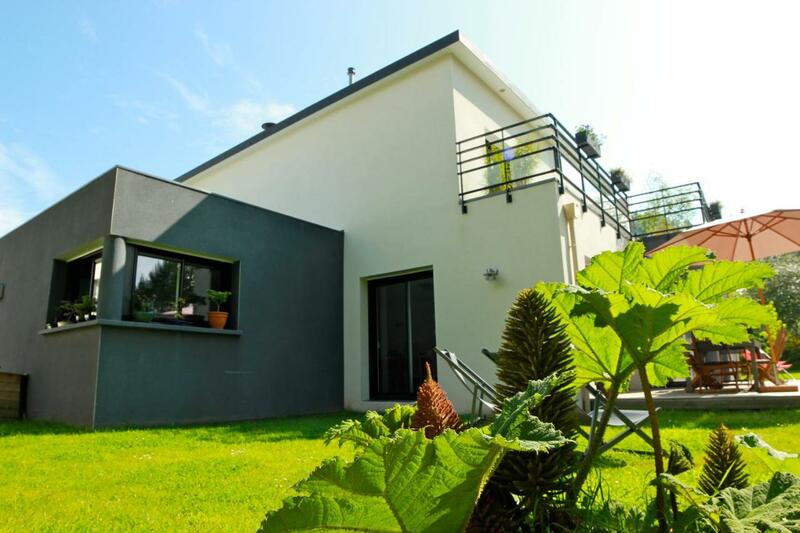 Showcasing a sun terrace and views of the city, The LightHouse is located in Châteaulin.Each room has a flat-screen TV with satellite channels. All rooms are equipped with a private bathroom. For your comfort, you will find free toiletries and a hairdryer.There is a hairdresser’s at the property.There are lots of activities in the area, such as biking and hiking. Brest is 23 miles from The LightHouse, and Quimper is 14 miles away. The nearest airport is Guipavas Airport, 23 miles from The LightHouse. The Lighthouse had everything we needed. The rooms were light and airy and a good size, the beds were comfortable and the shower just right. Rick and Ella encouraged us to use the tea and coffee making facilities in the meal room as often as we wanted to. Breakfast was a good selection of things we can eat (we have food allergies that they catered for). Rick and Ella were delightful -friendly and helpful and Chateaulin is very beautiful. Very spacious, clean and comfortable room. Very friendly and helpful owners. Right in the middle of town, only a few minutes walk to several good restaurants. Excellent breakfast. Would most definitely stay there again. Wonderful, cosy rooms and good breakfast. Very nice owner and easy to find. Very friendly and helpful owner, nice and very clean room! Featuring free WiFi and a barbecue, Le Domaine de Rugornou Vras offers accommodations in Brasparts.Every room is fitted with a flat-screen TV. Some accommodations include a sitting area to relax in after a busy day. Certain rooms have views of the garden or city. All rooms come with a private bathroom fitted with a shower. Extras include free toiletries and a hairdryer.You will find a shared lounge at the property.Brest is 24 miles from Le Domaine de Rugornou Vras, and Quimper is 23 miles away. Guipavas Airport is 23 miles from the property. Very nice house, room was fully equiped, but, unfortunately, the internet was broken and didn’t work. The owner was very pleasant to us. Great breakfast with crepes, jams, honey and local cake. Great breakfast at communal table, lovely setting in peaceful village. The complimentary glasses of cider on arrival. The French experience! Le petit déjeuné à la Française de grande qualité et varié. Equipement parfait dans les chambres , frigo, possibilité de faire du thé et café. La gentillesse de la patronne et de son père. Localisation au centre de la Bretagne. 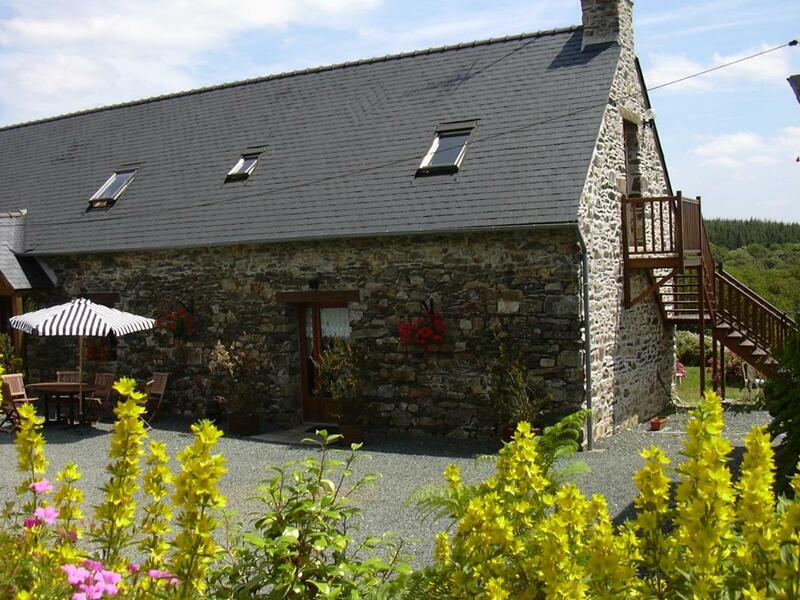 Featuring free WiFi, Ty Gorre Ker offers accommodations in Cast, just 23 miles from Brest. Free private parking is available on site.The rooms have a flat-screen TV. Certain units feature a sitting area to relax in after a busy day. You will find a kettle in the room. All rooms are equipped with a private bathroom. For your comfort, you will find free toiletries and a hairdryer.You can play ping-pong at the bed and breakfast. Quimper is 11 miles from Ty Gorre Ker, and Concarneau is 22 miles from the property. Guipavas Airport is 24 miles away. Lovely setting, charming, welcoming hosts. Good recommendations for dining in the local area. We really enjoyed time there and would definitely recommend it to others. Very friendly owners who’ve invested a lot of energy and time into making this a very comfortable B&B. Ideal location to extend our time in Brittany after a week at HPB Hilguy. We recommend a day at Morgat. Amazing place – beautifully restored stone farmhouse in gorgeous grounds. Our room was decorated with great taste, and the attached bathroom was luxe! Very comfortable king sized bed ( which could be converted to 2 singles) and lovely freshly ironed linens. This place is absolutely a gem. But credit must be given to the owners, Marsha and Jules who have undoubtedly put their hearts into the conversion. They have done ( and do) all the work themselves. They are charming hosts and provide a perfect refuge from the craziness of France in August. Breakfast was extensive and delicious and served in the pretty dining room on the main floor. I cannot say enough about how great this B&B is …. but if you are planning a trip in this area, then do try to stay here, and you will understand my enthusiasm. High quality bed and breakfast, spacious room with beautiful bathroom, excellent bed, very quiet and very friendly and helpful hosts. Perfect wifi and a good breakfast. Excellent value for money. Gîtes du Ménez-Hom is located in Plomodiern, just 17 miles from Brest. Free private parking is available on site.Some units feature a sitting area to relax in after a busy day. Every room is fitted with a private bathroom equipped with a shower.There is a shared kitchen at the property.Quimper is 15 miles from Gîtes du Ménez-Hom, and Concarneau is 27 miles away. Guipavas Airport is 19 miles from the property. The continental breakfast was superb. Home cooked cake and tarts, range of jams, yogurts, nuts etc. Our hostess was very friendly, and the gardens of the property were beautiful. Bedding very clean and comfortable. La situation au calme, parking, environnement fleuri, une grande chambre avec un espace salon agréable et une mezzanine également assez grande: largement suffisant pour 4. L’accueil simple et chaleureux. Accueil très agréable. Chambre spacieuse et confortable.Petit déjeuner copieux. Lieu idéalement placé pour visiter le Finistère . Nous avons apprécié l’accueil et la gentillesse de Madame Jacq, le duplex était agréable ainsi que le petit déjeuner. Featuring free WiFi throughout the property, Maison du Bonheur offers accommodations in Saint-Nic, just 16 miles from Brest. Free private parking is available on site.Each room includes a flat-screen TV with satellite channels. You will find a kettle in the room. Each room has a private bathroom. Extras include free toiletries and a hairdryer.You will find luggage storage space at the property.Quimper is 17 miles from Maison du Bonheur, and Concarneau is 28 miles from the property. The nearest airport is Guipavas Airport, 18 miles from Maison du Bonheur. Fantastic place to stay. Could not fault it. Perfect location in the countryside, but just minutes from the coast. Bedroom was beautiful. Breakfast was lovely. The hosts were so friendly. We loved it! Very beautifully decorated. The breakfast was the best we had this 10-day trip. A real escape to the country in Bretagne! From the moment we arrived the host and hostess, who are English, made us feel very welcome. The farmhouse has been renovated to a very high standard throughout and the bedroom was spacious, well furnished and very comfortable. Breakfast was excellent. Ti Braz offers accommodations in Landrévarzec. Guests can enjoy the on-site restaurant.Every room has a private bathroom.Brest is 27 miles from Ti Braz, and Quimper is 8 miles away. The nearest airport is Guipavas Airport, 29 miles from Ti Braz. Sredi bretonskega podeželja, v popolnem miru. Prijazni gostitelj; vseliš se lahko tudi pred predvideno uro, ker je tam pač prihateljica lastnikov in ti kar ona da ključ. Veliko mest v bližini. El personal nos ayudo en todo momento. El desayuno muy bueno!! This property is a 9-minute walk from the beach. Featuring free WiFi, a playground and a terrace, Chambres du Bout du Monde offers accommodations in Landévennec, just 12 miles from Brest. Free private parking is available on site.A terrace or balcony are featured in certain rooms. For your comfort, you will find free toiletries and a hairdryer. A flat-screen TV is provided.Quimper is 22 miles from Chambres du Bout du Monde, and Bénodet is 30 miles from the property. The nearest airport is Guipavas Airport, 12 miles from the property. 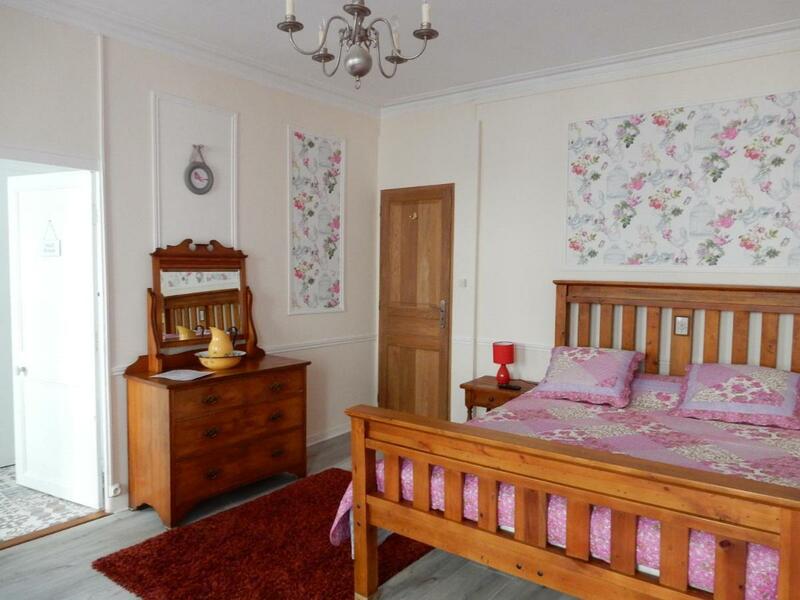 Very pleasant house and excellent room, very quiet too. Breakfast was freshly prepared and very good, and hosts Yannick and Carina were absolutely charming, so apart from being some way from any other habitation, everything could hardly have been better. The hosts were friendly and accomodating, speaking good English. breakfast was very informal with excelent chocolate cake. The room was very well equiped, clean and spacious. Very nice owners, very good beds and clean room. Quiet location and nearby a good creperie. Will stay again. Our hosts were a delightful couple. The breakfasts were fresh,homemade,beautifully displayed and delicious. The owners of the property were extremely friendly and went out of their way to make us welcome. Everything is bright, new, and nicely decorated. The surroundings are beautiful. This property is a 15-minute walk from the beach. Located in Plomodiern, 19 miles from Brest, Chambre d’Hôtes Entre Mer et Monts features free WiFi access and free private parking. Guests can enjoy the on-site bar.A flat-screen TV , Blu-ray player and DVD player, as well as a CD player are featured. Certain units have a sitting area to relax in after a busy day. You will find a kettle in the room. Every room is equipped with a private bathroom. Extras include free toiletries and a hairdryer.Quimper is 14 miles from Entre Mer et Monts, and Concarneau is 25 miles away. The nearest airport is Guipavas Airport, 21 miles from the property. Accueil formidable, petit déjeuner parfait, des conseils pour les visites, une chambre au calme, spacieuse et propre, une localisation proche de Locronan. Supervriendelijke mensen, lekkere kamer, aan alles is gedacht! Je mag van alles aan eten en drinken pakken en ook meenemen voor smiddags. Een van de weinige Franse eigenaren die Engels spreken! Colazione abbondantissima, i padroni di casa gentilissimi e il signore dà qualunque informazione per girare i dintorni. La casa è in campagna, vicinissima ad una spiaggia e comodissima per visitare tutti i siti di maggior interesse della zona. Camera deliziosa. Tutto perfetto. Die Gastgeber sind super, sehr hilfsbereit und extrem freundlich. Sie haben viele Tipps parat. Die Zimmer sind sehr groß und gemütlich. Man fühlt sich richtig wohl! 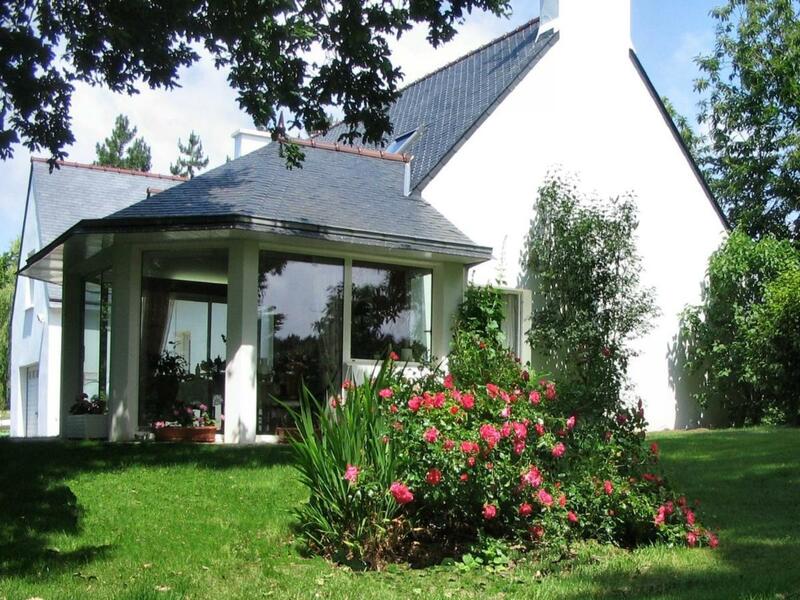 The above is a top selection of the best bed and breakfasts to stay in Pont-de-Buis Brittany to help you with your search. We know it’s not that easy to find the best bed and breakfast because there are just so many places to stay in Pont-de-Buis Brittany but we hope that the above-mentioned tips have helped you make a good decision. We also hope that you enjoyed our top ten list of the best bed and breakfasts in Pont-de-Buis Brittany. And we wish you all the best with your future stay!